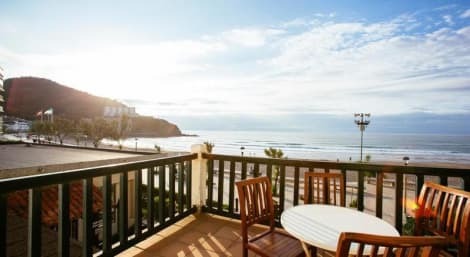 Set on the beachfront in Bakio, with a terrace overlooking the sea, Hotel Restaurante Arimune offers an on-site restaurant and bar. This small hotel features rustic-style rooms with free WiFi. Each room comes with a flat-screen TV, wardrobe and garden views. The private bathroom includes a bath. International dishes are served in the Arimune's restaurant, featuring sea views. There is a cosy shared lounge area with a reading area and TV. The hotel also has a second outdoor terrace with mountain views. Bilbao is 28 km from the property and Guernica is 25 km away. lastminute.com has a fantastic range of hotels in Bakio, with everything from cheap hotels to luxurious five star accommodation available. We like to live up to our last minute name so remember you can book any one of our excellent Bakio hotels up until midnight and stay the same night.